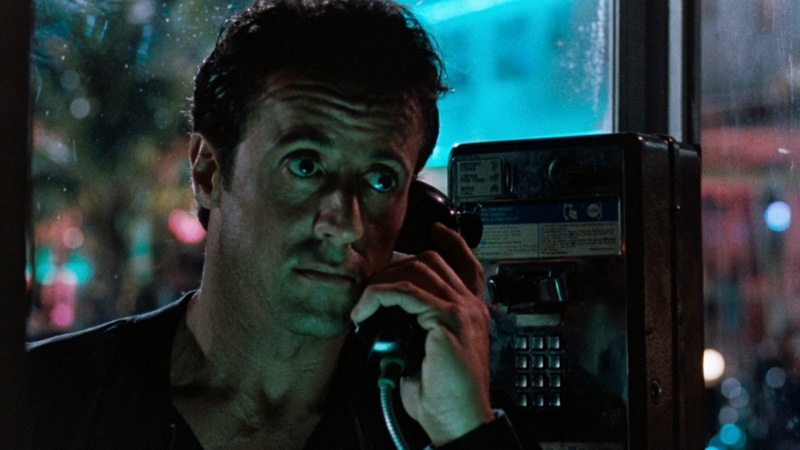 A galumphing revenge drama aiming for a cool vibe but for the most part stumbling on a puerile script, The Specialist teams Stallone with Stone and the results are predictable: plenty of well-toned body parts and a tone-deaf absence of plausibility. Explosives specialists Ray Quick (Stallone) and Ned Trent (James Woods) used to be partners in the CIA, conducting covert operations to blow up drug barons in South America. After a bitter dispute over civilian casualties, both of their CIA careers come to an end and Ray becomes a reclusive explosives-expert-for-hire. Ned blames Ray for ruining his career, and joins a brutal Miami criminal cartel, led by the father and son team of Joe and Tomas Leon (Rod Steiger and Eric Roberts). The sultry May Munro (Stone) repeatedly contacts Ray, imploring him to accept an assignment to kill Tomas and two of his henchmen. May was a young girl when Tomas killed her parents in cold blood; now she wants revenge, and she instigates a romantic affair with Tomas to get close to him. After initially refusing to help, Ray accepts the job and starts blowing up Tomas' inner ring. Joe gives Ned the task of uncovering the identity of the bomber. May's revenge plan will flush Ray into the open, where Ned will be waiting to pounce. The Specialist starts with plenty of style and few explosions. It ends with plenty of explosions and no style. Director Luis Llosa appears to be fully aware that the material is quite thin, and initially he makes up for it with a brooding vibe, Stallone's Ray angry at the world and coming out of hiding only to play with his tech gadgets and blow bad guys up, while Stone's May is paraded outdoors in ever shorter mini dresses or indoors mostly naked. It's the type of film that attempts to shift focus from the nonsense actions of the main characters to the coolness coefficient of the characters themselves, and Llosa gets away with it for about 30 minutes or so. Then it all gets really silly, May embroiling herself in a distasteful romance with the abusive Tomas, and Ray falling in love with a voice over the phone, while James Woods as Ned accelerates the rate of his angry-man one-liners. Woods becomes the most watchable thing in the movie, and not in a good way. Ridiculously inserted overnight by Joe into the senior ranks of local enforcement authorities, Ned spends most of the movie either throwing tirades or chasing one step behind Ray and providing dry commentary on his explosive handiwork. It's an over-the-top performance that serves as a reminder of how absurd the whole plot really is. Rod Steiger cruises through the movie wondering when other characters inspired by faint recollections of The Godfather will make an appearance, while Eric Roberts as Tomas suddenly seems to be about the same age as Sharon Stone's May, although he is supposed to be a good 15 years older in order for the revenge plot to make any sense. After May switches sides from good to evil and back enough times to make sure that it really does not matter, The Specialist ends with Stallone unleashing his explosive fury on an entire city block. When the ideas run out (and in this case, a long time afterwards), just blow everything up.